Google Pixel Review: is Google's first smartphone Pixel perfect? Google's first smartphone is finally here - welcome the Pixel. After months of leaks, it was no surprise the Pixel replaced the search giant's Nexus range of smartphones, now with a more premium design, the latest guts, and a higher price tag. Read more: Google Pixel Slate review: is this high-end tablet a winner? We've spent the best part of a week reviewing the Pixel so far - do we think Google was right to drop the budget Nexus brand and go more upmarket? And is the Pixel a worthy competitor to the likes of Samsung, HTC, and Apple? Note: Google has released the Pixel in two sizes, the 5.0-inch Pixel, and the 5.5-inch Pixel XL. Unlike the iPhone 7, these phones share identical hardware and features (apart from the obvious screen and battery size), so we've reviewed them both here. The Google Pixel is a good looking smartphone, but it's a little uninspired - it certainly doesn't evoke a deep desire to fondle and stroke it. But we do like the way it looks. The rounded edges make it comfortable to hold, and everything about it feels very solid, definitely not cheap. We don't know what 'grade' aluminum Google has used here, but it feels less prone to scratches than the iPhone. Which is great news. The stand out 'design' element on the Pixel is a glass panel on the rear of the device. This isn't some touch sensitive trackpad, it's just there to make it look a little different to other smartphones, and improve wireless antenna performance, probably. In the middle of the rear glass panel is a fingerprint sensor. That's our favourite position, as your index finger naturally rests there. This fingerprint sensor also doubles as a mini trackpad - which is quite useful for the larger XL model. In a way, the design mimics Google's brand identity, it's quirky, slightly robotic, and soulless, but ultimately, quite endearing. The smaller Pixel has a 5.0-inch display, and the Pixel XL features a 5.5-inch display. We've tested both and much preferred the size of the smaller phone, although the Pixel XL didn't feel comically oversized. Taking a different tact to Apple, both the Pixel and Pixel XL have the same features, so it's only the screen and battery size that differentiates them. The standard Pixel has an HD resolution with a PPI of 441, while the Pixel XL has a 2K display and a PPI of 534. Both are pleasingly sharp (although, not as standout as the Samsung S7) and the AMOLED panels are vibrant and dynamic. 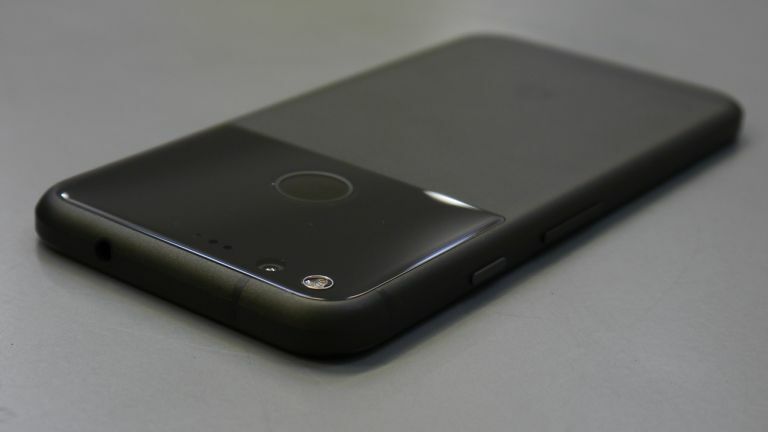 Google was keen to highlight the headphone jack on the top of the device, and that there's no camera bump. There's a USB-C port and a single speaker on the bottom of the Pixel (and a fake speaker for symmetry). Neither phone is water resistant, which is a bit of a shame. It's also quite thick at 8.5mm, but the tapered edges do a good job of masking that. There are three colour options, 'Quite Black', Very Silver', and 'Really Blue'. T3's advice is to always bet on black, it looks great. Since this is now Google's flagship handset, it makes sense that it uses the company's latest software and services. Google Assistant plays a big role in the operating system. This replaces Google Now, making it more intelligent, and giving the virtual assistant more of a personality in line with Siri and Cortana. Google Assistant is a little more friendly, more personal, chatbot-powered AI that can answer your questions, book dinner reservations, play games and suggest smart replies to send your friends when you don't have the time or the energy to actually compose a proper message. Assistant can be accessed by holding the home button, the home screen widget, or saying the hot words “Okay Google”. There are also some nifty software features, such as automatic operating system updates, 24/7 customer assistance, and both Pixels will come with Allo, Google's new instant messaging app, and Duo, the video calling app, pre-installed. After our time with the OS, it feels like a genuine improvement over stock Android, although not the biggest leap forward. Google Assistant's voice recognition is very impressive, it never really misunderstood what I was saying, but how useful it is depends on your willingness to talk to your smartphone in public. We used it a lot more around the house than on a crowded train. The Pixel is a very fast smartphone, just like all flagships in 2016. It runs on Qualcomm's latest Snapdragon 821 processor with 4GB of RAM. Both devices have either 32GB or 128GB of storage, with no option to expand via MicroSD. If you're worried about storage, the Pixel comes with free, unlimited Google Photo storage, which is a nice little bonus. The 5.0-inch Pixel has a 2770 mAh battery, whereas the larger Pixel XL features a 3450 mAh battery. Both have very solid battery lives, easily managing a full day when being used more heavily, and stretching up to a day and a half between charges with light use. The Pixel also features quick charging, with the ability to replenish seven hours usage from a 15 minutes charge. We found that really useful, but the supplied wall plug has a female USB-C port, which isn't so useful. Google is really proud of the Pixel's camera, both smartphones feature a 12-megapixel sensor and f/2.0 aperture lens. The company had the lens and sensor rated by DxO (expert camera testers), and the Pixel came out top in their ranking of smartphone cameras with a score of 89. It's worth noting that DxO test cameras in a lab, and this doesn't always translate to real world testing. How did we find the Pixel camera in real world testing? We loved it, although we'd have to do more side-by-side testing to see it it's better than our previous favorite, the Samsung Galaxy S7. The Pixel handles colour really well, making images look lovely and saturated. You can tell there's lots of post processing work going on here, but the result is really gorgeous, if a little unrealistic, images. We like that it can take reliably good images when just left in auto, something the S7 and iPhone 7 are also very good at. It looks like the Pixel has used its HDR+ mode to create a really attractive image, with balanced shadows and highlights. Low light performance is also very good, despite only having an aperture of f/2.0 compared to the S7's f/1.7. We don't think it deals with movement as well as its competitors. This may be because the Pixel uses electronic image stabilisation (EIS) rather than optical image stabilisation (OIS). This does, however, result in smoother video and no camera bump. Scroll down to the bottom of this page for more image samples. I like this smartphone a lot, the software is great, and the hardware has a certain odd charm to it. The camera is also very good, which we're really pleased about. The biggest downside is that it lacks any sort of water resistance, something that even the iPhone now has. That's the only thing stopping us giving this a 5-star rating. Google's first smartphone has been a big hit with us, and we think it's a credible alternative to the Samsung Galaxy S7, HTC 10, and the like. Want the best smartwatch to go with that phone?